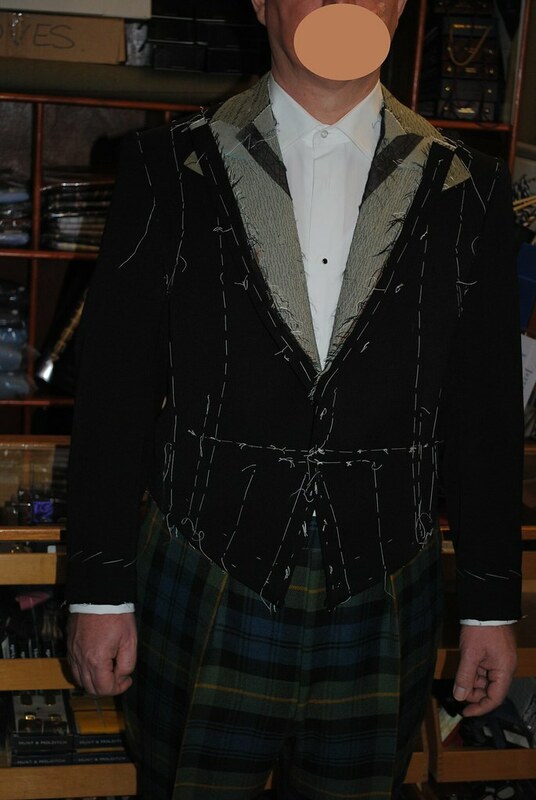 This is a Scottish jacket and the draft is similar to a Military Mess Jacket, it is slightly longer because it is going to be worn with Trews and not a kilt (or high waisted brace trews). It has no centre backseam and it is a fiddle to match the sleeve at the back pitch being a down left shoulder. Is that the first fitting ? Nice to see a well cut and fitted garment. Did you make the trews as well? Yes but it was about six years ago and he has lost weight,( they now look quite full on his seat and hips). They are high back split bands designed to be worn with braces, we put the prominent colour in the tartan down the crease and also do the same at the back crease. This takes a lot of cloth (usually 2-5m double width)but is well worth the effort. So really they are tartan trousers not proper trews, mostly we make them with plain fronts and the legs are cut quite slim and self supporting with a normal body rise. We have made military trews with no side seam which take quite a bit of iron work. In the past I have got talked into making trews for the KOSB regiment that needed the white check to be round the hem. (it was darted in the front to add angle). They worked out well but needed accurate measurements, I am sure quite a few pairs will have ended up in the bin after the fitting. We are not military Tailors and have only taken on this work as a favour for good customers. You have got to take your hat off to military tailors not only have the garments to fit but end up with the check in a certain part of the garment. Recently we made a tweed suit for the Black Watch Regiment and it was a one way check and the blue check had to be cut to the top. Is the trews fabric the same as what the kilt would be made from? I mean the same weight? The placement of the tartan is tricky indeed! And does use up a lot of cloth- but there really isn't any way around it is there. Will you post a photo of the finished jacket? Yes the trews are made from the same mid weight tartan used for kilts. I have quite a few other things to make before I will get a chance to do more to the Jacket but I will post some pictures when it is finished. This link is to my blog showing a a couple of pairs of tartan trousers, I am modeling them not the customer (my thighs are a bit fuller than normal and I had to breath in a lot with one pair ). I thought a few cutters would be interested in the pattern matching especially the one way tartan. 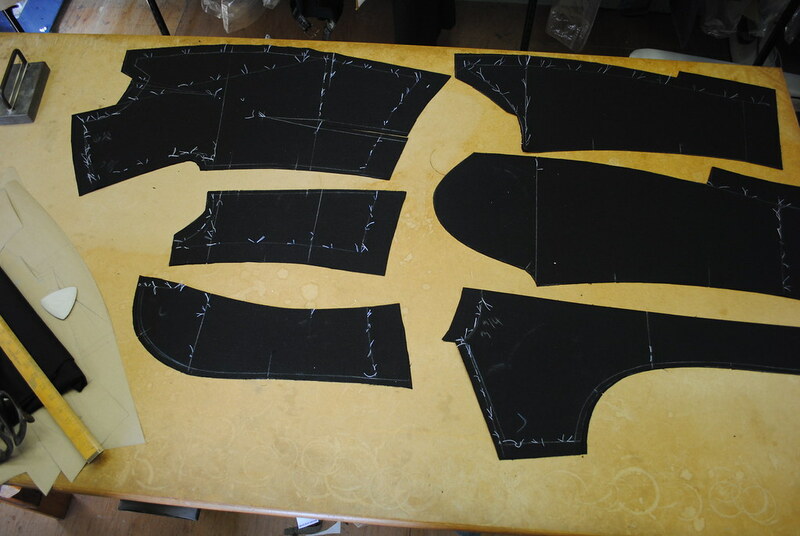 I still draft a pattern for each customer but they get straight finished without a fitting and are machined together, this is one of the ways we survive in Scotland because if we only offered full bespoke our market share would be greatly reduced. I am going to make a link in the future showing trews with no side seam, this is based on the military side construction draft and it makes them very open in the legs so it takes quite a lot of iron work to correct this. How beautiful done. Do you line them? Thank you, yes we do usually have lining in the fronts especially if the cloth is a bit coarse. It's quite some time since I have logged onto the forum. but I try, from time to time to keep up with what's going on. I have just been reading this thread and must agree with Jukes, It's nice to see a well fitting tailored garment. All credit to 'Measure man' I also had a look at his blog. It's nice to see someone keeping up the traditions. One thing I did notice on the trews, You are putting on a separate waistband, I would have thought with the large check, a grown on waistband would have been better? To also answer a question posed in another thread regarding old cutting books as opposed to modern books. How many modern books would have drafts of these classic garments?